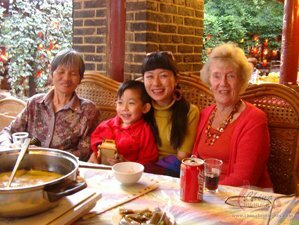 As a guest at a meal, one should be particular about one’s appearance and determine whether to bring small gifts or good wine, according the degree of relationship with the master of the banquet. It is important to attend and be punctual. Seating arrangements are very important in China. On arrival one should first introduce oneself, or let the master of the banquet do the introduction if unknown to others, and then take a seat in accordance with the master of the banquet’s arrangement. 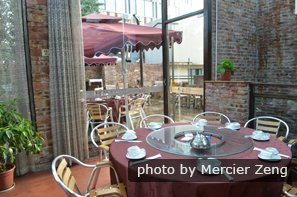 The seating arrangement is probably the most important part of Chinese dining etiquette. If the guest of honor or most senior member is not seated, other people are not allowed to be seated. If he hasn’t eaten, others should not begin to eat. When making toasts, the first toast is made from the seat of honor and continuing down the order of prominence. Let older people eat first, or if you hear an elder say "let&apos;s eat", you can start to eat. You should not steal a march on the elders. You should pick up your bowl with your thumb on the mouth of the bowl, first finger, middle finger the third finger supporting the bottom of the bowl and palm empty. If you don’t pick up your bowl, bend over the table, and eat facing your bowl, it will be regarded as bad table manners. Moreover, it will have the consequence of compressing the stomach and restricting digestion. 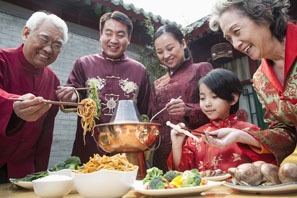 Most table manners in China are similar to in the West. Don&apos;t be deceived by what you might see in a local restaurant on the streets. Chinese manners don&apos;t consist of slurping food down as quickly as possible, and shouting loudly! Take food first from the plates in front of you. When helping yourself to the dishes, you should take food first from the plates in front of you rather than those in the middle of the table or in front of others. 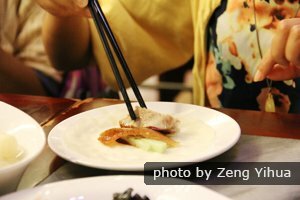 It&apos;s bad manners to use your chopsticks to burrow through the food and "dig for treasure" and keep your eyes glued to the plates. 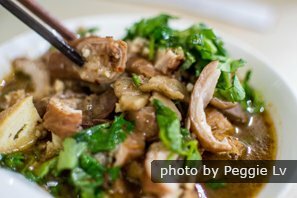 When finding your favorite dish, you should not gobble it up as quickly as possible or put the plate in front of yourself and proceed to eat like a horse. You should consider others at the table. If there is not much left on a plate and you want to finish it, you should consult others. If they say they don’t want any more, then you can eat proceed. Concentrate on the meal and your companions. Watching television, using your phone, or carrying on some other activity while having a meal is considered a bad habit. You should try to refill your bowl with rice yourself and take the initiative to fill the bowls of elders with rice and food from the dishes. If elders fill your bowl or add food to your bowl, you should express your thanks. 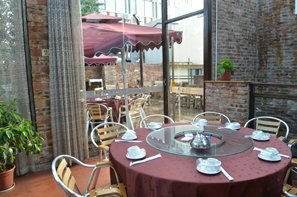 Tea usually is served as soon as you have a seat in a restaurant. A waiter/waitress serves you tea while you read the menu and decide what to order. 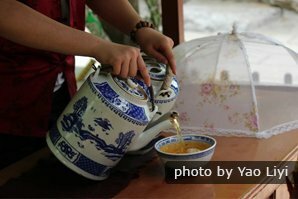 The tea pot is left with you on the table after everyone around the table&apos;s cup is filled with tea. Guests then serve themselves. When someone pours tea into your cup, you can tap the table with your first two fingers two or three times, showing thanks to the pourer for the service and of being enough tea. The pourer will stop pouring when seeing the gesture. It is not good manners to pick up too much food at a time. You should behave elegantly. When taking food, don’t nudge or push against your neighbor. Don’t let the food splash or let soup or sauce drip onto the table. When eating, you should close your mouth to chew food well before you swallow it, which is not only a requirement of etiquette, but also better for digestion. You should by no means open your mouth wide, fill it with large pieces of food and eat up greedily. Don’t put too much food into your mouth at a time to avoid leaving a gluttonous impression. Neither should you stretch your neck, open your mouth wide and extend your tongue to catch food you are lifting to your mouth. Put bones or other inedible parts of the meal on a side plate. 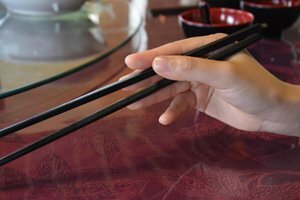 When removing bones or other inedible parts of the meal from your mouth, use chopsticks or a hand to take them and put them on a side plate (or the table) in front of you, instead of spitting them directly onto the table or the ground. If there is food around your mouth, use a tissue or a napkin to wipe it, instead of licking it with your tongue. When chewing food, don’t make noises. It is best not to talk with others with your mouth full. Be temperate in laughing lest you spew your food or the food goes down your windpipe and causes choking. If you need to talk, you should speak little and quietly. If you want to cough or sneeze, use your hand or a handkerchief to cover your mouth and turn away. If you find something unpleasant in your mouth when chewing or phlegm in the throat, you should leave the dinner table to spit it out. 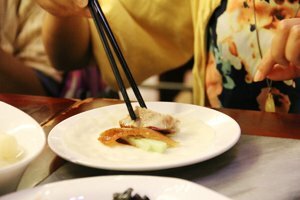 Do not stick chopsticks vertically into your food when not using them, especially not into rice, as this will make Chinese people think of funerals. At funerals joss sticks (sticks of incense) are stuck into a pot by the rice that is put onto the ancestor altar. Do not wave your chopsticks around in the air too much or play with them. 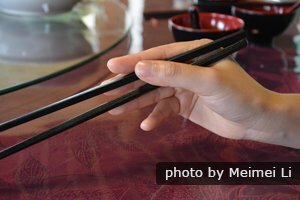 Some consider it unhygienic to use the chopsticks that have been near (or in) one’s mouth to pick food from the central dishes. 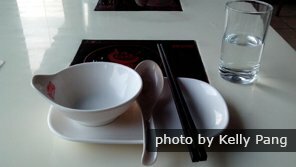 Serving spoons or chopsticks can be provided, and in this case you will need remember to alternate between using the serving chopsticks to move food to your bowl and your personal chopsticks for transferring the food to your mouth. Our tours can be customized. 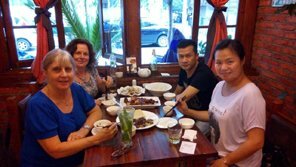 Just tell us your requirements and interests, and our guide can assist in making sure your food is carefully prepared, so you enjoy a wonderful trip without worrying about what might be lurking in your bowl. 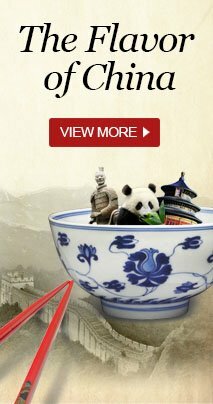 Top 10 Dishes from "A Bite of China"